Through the application of the latest technology combined with the expert personnel, Spectra Anodizing continues to deliver materials that meet or exceed world-class standards. Our partner, Spectra Anodizing, has earned industry-wide recognition as a leader in anodic processing. It is the largest producer of anodized aluminum by volume in Canada. Team members are the most knowledgeable in their field of aluminum anodizing. The Research & Development team has advised industry peers and government agencies on topics ranging from process techniques to environmental controls. 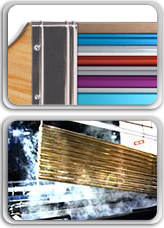 Spectra Anodizing’s specialties are architectural grade and custom finishes. Additionally, polishing and brushing services are available. Please contact us at info@spectraaluminum.com to learn more.